Posted on Mon, Nov 19, 2012 : 5:19 p.m. The Ann Arbor Transportation Authority ceremonially broke ground Monday on what it says will be one of the state's most eco-friendly public transportation facilities when completed. The $8.1 million project calls for demolishing the one-story Blake Transit Center at 331 S. Fourth Ave. downtown and constructing a new two-story transit center in its place. AATA officials gathered at the site along with local, state and federal officials to mark the start of construction. 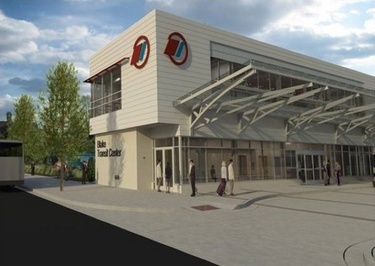 The new and improved transit center is slated for completion by fall 2013. This rendering and others showing what the new Blake Transit Center will look like can be found at BlakeTransitCenter.com. "The development of this project will help to improve the quality of life in Washtenaw County by providing residents with a modern, clean and visually appealing structure that will better accommodate riders, embrace new eco-friendly technologies and enhance the public transit customer experience," AATA CEO Michael Ford said in a statement. The new 12,019-square-foot building will include space for a main customer service lobby, restrooms, offices for AATA and getDowntown staff, conference rooms, a staff break room, and a basement for storage and mechanical equipment. A high canopy of steel and tinted glass will run along the northern side of the building. Bicycle parking and benches will be included on site, and bus stops along Fourth Avenue will be redesigned. The new transit center will take shape at the southeast corner of the site, a shift away from the northwest corner, with more of a connection to Fifth Avenue. AATA officials said construction will be coordinated with the city, the Downtown Development Authority and the Ann Arbor District Library to minimize disruption to the area. AATA Board Chairman Charles Griffith said the architectural and engineering designs ensure the new downtown transit center, which replaces a facility built in the 1980s, will receive LEED Gold certification from the U.S. Green Building Council for environmental excellence. The new facility's design also complies with guidelines required under the Americans with Disabilities Act, AATA officials noted. The AATA's decision to go ahead with the project comes less than two weeks after the Ann Arbor City Council effectively killed the AATA's plans to create a new countywide transit authority. The council voted 10-0 on Nov. 8 to opt out of the countywide authority, which would have replaced the AATA, following the lead of most of the municipalities in the county. The council directed the AATA instead to focus on improving services in the county's urban core. Mayor John Hieftje released a statement on Monday indicating his support for going forward with rebuilding the Blake Transit Center. "This project signals the beginning of an exciting new chapter in the AATA's history of success and would not be possible without the strong leadership and vision of the entire AATA team," he said. AATA officials said the $8.1 million cost estimate exceeds original estimates due to additional needs identified through community input and environmental analysis, as well as the costs of the city's approval process. They noted more than $7 million of the total costs are funded through state and federal grants that were earmarked for the creation of a new transit center. AATA officials argue a new Blake Transit Center is necessary to meet growing passenger demands based on data that shows ridership has increased more than 60 percent since 1987, with more than 5,000 riders daily and 1.5 million riders annually arriving and departing through the center. Bus traffic also has increased with an hourly average of about 40 buses accessing the facility. More details are available at BlakeTransitCenter.com. Wed, Nov 21, 2012 : 9:02 a.m.
Ann Arbor and Grand Rapids are the two Michigan cities that draw people from beyond to visit, shop, eat, and walk around town. Grand Rapids has done a superb job making an attractive downtown. The walkway is a winter life saver. How about it, Ann Arbor? Shouldn't Ann Arbor be just as appealing? We're fun, but we have room for improvement in the visual department. Make an attractive place for all forms of transportation to meet, or at least connect with one another? Have winter walkways between the transportation center and a new library (yes, we could use one-save money somewhere else)? Make downtown, whether it be our existing historic buildings or new architecture as needed, visually striking? The City Hall building is an eyesore. As far as I can tell with the drawing, so is the AATA bus center. Yes, why haven't the library board, the bus people and the DDA gotten together to discuss this? What about the Greyhound bus? What about connecting with the train station? What about accommodating cabs within one's vision when stepping off of the bus? How about a visitor center being there? How about a contest for sculpture for outdoor art near the new construction? One site for art for UM winner? One site for art for AAPS winner? One site for art for local artist winner? More winners? Find a use for the old Maud's building, which never seems to be utilized? Have more frequent cleaning of the street and sidewalks near there because somehow it always looks dirty? I rarely go downtown anymore, and I used to do it all the time. Tue, Nov 20, 2012 : 10:54 p.m.
$675 per square foot - this is simply insane! This people need to be stopped before they burn more of our money. Thu, Nov 22, 2012 : 1:10 p.m. I thinks the public art that's going cost the most. Tue, Nov 20, 2012 : 10:09 p.m. Does it have to look so dull? What happened to ARCHITECTURE in this town? The whole thing should have been redesigned to accommodate more buses so that 4th Ave would be less congested. As it is, the combination of the buses and the entrance to the parking lot across the street creates too much havoc. We have a great city, but it seems that the dullest and least imaginative people in town are in charge. Tue, Nov 20, 2012 : 6:16 p.m.
What percentage of the $8.1m goes to the DDA? Tue, Nov 20, 2012 : 2:59 p.m.
Tue, Nov 20, 2012 : 7:32 p.m.
Tue, Nov 20, 2012 : 2:49 p.m. Probably become a place for the homeless to hang out. Just like the downtown library! Tue, Nov 20, 2012 : 6:57 p.m.
dang those homeless people! such a nuisance(sarcasm)!! Tue, Nov 20, 2012 : 5:27 p.m.
Gasp! People hanging out in the library! What will we do?!? Stop being so judgmental. Can we rename it the Rosa Parks bus terminal? I also would have liked combining the AATA with the bus station on Huron. It would also clear up those information signs downtown... is it clear to people that need/use the signs the difference between the Bus Station and the Blake Transit Center (both of which are listed on signs downtown)? Tue, Nov 20, 2012 : 4:33 p.m.
Its so infuriating. For a town as &quot;progressive&quot; as AA, with so many creative people living here, we are stuck with public officials with absolutely no vision. It would've been SO EASY and inexpensive to incorporate the Greyhound bus station into this new project, in an effort to make transportation in this region a little more &quot;multi-modal&quot; (even though both are buses). As is, there is a separate station for local buses, long-distance buses, university buses, and trains...all located in different parts of town. And don't get me started about the utilitarian architectural style of the building. Seriously? 50 shades of beige? So much for AA being an artsy or funky town. Uggh. Tue, Nov 20, 2012 : 2:46 p.m. I would have preferred that the City, Library, DDA and AATA would have talked to each other a bit before proceeding/proposing/studying their individual projects. Doesn't this building design support future development atop the 2-story structure? If not, it should to be in line with the the goals of mixed used, increased density, etc. Tue, Nov 20, 2012 : 1:10 p.m. Almost full circle. The Ymca site was once to be the AATA transit center - a real fiasco. Closer to it now, the AATA is constructing basically the same ugly shoebox used now with a conference room perched on top. For $8 million we could have had Hugh Hefner's Chicago mansion complete with fireplace and pool. The convention-center-with-books NO vote probably had nothing to do with the sudden announcement and design choice, either. So, does building on Fifth Ave. (again) also mean staging buses there once the project is finished? (We'll show Jerusalem Garden who's the boss in this town). Tue, Nov 20, 2012 : 12:46 p.m. I'm not sure why the AATA is building a two story building when a three story building would have been only slightly less expensive and the extra floor could have been sold or rented as office space to defray the cost of this project to the AATA's general fund? I thought the vision for the downtown was New Urbanism? How does a single use, two story building add vibrancy and intensity to the downtown area? Where is the multi-use, multi-story building going to be if not in downtown? Tue, Nov 20, 2012 : 3:32 p.m.
Don't worry; in 10 years they'll decide it wasn't sufficient, AATA will increase the millage, and they'll tear this down and build the 3-story one. Tue, Nov 20, 2012 : 12:04 p.m.
Tue, Nov 20, 2012 : 11:52 a.m.
Tue, Nov 20, 2012 : 10:02 a.m. It is actually good to see an improvement going on at that site. The current transit center is crowded and not very user friendly and has only one unisex bathroom that you can only access by beiing buzzed in by the lady at the desk behind the plexiglass wall. Oh, and I don't know if anyone else noticed, but the article states that &quot;A high canopy of steel and tinted glass will run along the northern side of the building.&quot; That is incorrect inasmuch as the canopy will be facing the south side, (as shown in the artist's renderiing) not the north side. The only way the article could be correct is if the rendered drawing were showing the fifth ave. side of the center, in which case, the bus shown there would be facing the wrong way. Just a minor detail, but those things add up. Tue, Nov 20, 2012 : 4:41 p.m. If you look on the blaketransitcenter.com webpage you can see that the view AA.com shows is from the northeast , i.e., the 5th Ave. side , and what you're seeing is the back of a bus travelling south on 5th. There's another view from the northwest in which you can see the library in the background and the canopy definitely on the north side of the center. Tue, Nov 20, 2012 : 2:58 a.m.
What a colossal waste of money. They should have purchased the parking lot next door so they could have space load &amp; unload the buses. Instead we'll continue to see people wandering otu onto a busy street and risk getting run down. It's just like the library. The voters tell them NO but it just doesn't matter. Tue, Nov 20, 2012 : 10:41 a.m.
Tue, Nov 20, 2012 : 9:38 a.m. It isn't a colossal waste of money, so stop being so dramatic about it. It's ridiculous that you complain about it being a colossal waste of money and then in the same breath ask why they didn't purchase the lot next door, which if it were privately owned would probably also sell for a lot of money. But, you don't even know that the city owns that lot. if you'd pay attention and remember what has occurred in the not so distant past, you would remember that the city purchased that lot after the Y was demolished. That's why it's currently a public parking lot. Tired of hearing complainers who have no idea how the city's business works, no idea how it's funded, no decent alternatives, aren't willing to become involved in the process, yet think their opinions on the matter are the correct ones. Stop carping and crying and get invovled in the process if you don't like it. I'm betting once you find out the process and how it works, you'll be a lot less critical and negative. But as it is, you base your opinon on some vague idea that it could be spent on something &quot;better&quot;, although if that happened, I'm sure you'd still complain. Voters didn't have anything to do with the transit center. That was the library. And if you complainers are proud of what happened there, with your short-sighted stingy ideas, then I just find myself planting my palm in my forehead and shaking my head in disbelief. Get a clue and quit griping. Don't like the way things are run, do something like get involved. If not, then quit complaining, you are embarrassing yourself and the rest of Ann Arbor's citizens. Tue, Nov 20, 2012 : 1:29 a.m.
Tue, Nov 20, 2012 : 7:31 p.m.
Bear, and the new building fixes those problems how? P.S. - there's a very good reason that you have to be buzzed into the bathroom. Anyone who goes to the bus station could guess. Tue, Nov 20, 2012 : 9:41 a.m.
Hmmmmm.... if you are saying that, you must have never been in the current transit center. it's old, it's cramped, it has only one bathroom that you have to be buzzed into to use. There isn't enough protection for passengers trying to move from bus to bus. There is plenty to improve upon from the old center. Tue, Nov 20, 2012 : 12:50 a.m. The article says the transit center is from the 1980s, but I could swear they did some major renovations less than 10 years ago. Does anyone else remember this, or am I just going crazy? Tue, Nov 20, 2012 : 10:35 a.m.
Tue, Nov 20, 2012 : 3:02 a.m. It is from the late 80's and the only renovations were replacing the concrete area for buses and sidewalk. Tue, Nov 20, 2012 : 12:36 a.m. Cool, spending millions on stuff we don't really need while ignoring basic services. How about some police, firefighters, or road improvements? Tue, Nov 20, 2012 : 5:48 a.m.
Did you read the whole article? &quot;They noted more than $7 million of the total costs are funded through state and federal grants that were earmarked for the creation of a new transit center.&quot; Granted, the extra costs might add up to almost $1m, but we spent $50m combined on police, fire, and the street millage in 2011. Seems to me that the added benefit of a new transit center is worth more than the 2% added benefit to the other categories, given the state and federal grants. Tue, Nov 20, 2012 : 2:21 a.m.
yeah, and you are spending money on internet service you don;t REALLY need. Spending money t improve things like libraries, parks and mass transit are why people CHOOSE to live in Ann Arbor and pay a premium to do so. If people are so against these things they are free to move to the middle of nowhere. The AATA is separate funding from police and fire. It is always an option to put a special mileage on for police and fire. We will all wait to see your name on the ballot next time. Just because YOU think a project is not as important does not make it so. People riding the AATA from Ypsi and townships brings tax revenue to the city every single day. Tue, Nov 20, 2012 : 12:13 a.m.
Tue, Nov 20, 2012 : 11:36 p.m. Indeed, zanzerbar. One of the things that I love about travelling in Canada is that such combined-mode transit centers are far more common. Tue, Nov 20, 2012 : 9:26 a.m.
You know, city council has been trying to combine a rail station/bus terminal for years on Fuller rd. and all anybody wants to do is complain. So here they go, doing the best that they are capable of and all we hear is complaints? What is wrong with people? Is this all we've been reduced to? complainers and whiiners? I don't see any of the people who carp about what is being done working to make something better happen. All I'm hearing is complaining. Tue, Nov 20, 2012 : 2:59 a.m.
Kalamazoo has the best combination Amtrak, Local bus and Greyhound/Indian Trails, Local Taxi in one restored historic railroad building. Mon, Nov 19, 2012 : 11:45 p.m. The ritualistic repetition of the act of building sacred spaces dates back millennia in Japan. The sanctuary of Ise, for example, is copied every twenty years and then the former iteration is demolished. The current hondo and pagoda of Ise are the 67th rebuild for which records exist. The Blake Transit Center is new to this tradition, but requires tithes to be paid on time. Mon, Nov 19, 2012 : 11:09 p.m. They should add three more floors for a conference center, a library, and, an elevated rail platform. Tue, Nov 20, 2012 : 10:40 p.m.
Tue, Nov 20, 2012 : 10:39 p.m.
Steven, You will no doubt get your wish on every other piece of available real estate in the city even though that is a terrible way to redevelop downtown property. Tue, Nov 20, 2012 : 1:20 p.m.
Actually, they should have auctioned the air rights over the building that they needed and worked with the winner to design a tall building and they might have offset the entire cost of the new bus station building. That land is valuable and it's a waste to build a two story building on it! Tue, Nov 20, 2012 : 12:51 p.m.
Tue, Nov 20, 2012 : 9:23 a.m.
Tue, Nov 20, 2012 : 3:26 a.m.
Don't forget the public art! Tue, Nov 20, 2012 : 12:37 a.m.
Mon, Nov 19, 2012 : 11:50 p.m.
Mon, Nov 19, 2012 : 10:52 p.m. While rebuilding, I wonder if it would have made sense to somehow try to consolidate rail and bus services...one building instead of two. Mon, Nov 19, 2012 : 10:51 p.m.
Mon, Nov 19, 2012 : 10:46 p.m.
Is the cladding material actually all beige? This town really needs to get away from the brick and tan color palette once in a while. Tue, Nov 20, 2012 : 5:18 p.m.
Purple (plum) could actually work if it was toned down. Tue, Nov 20, 2012 : 2:11 p.m.
Tue, Nov 20, 2012 : 11:55 a.m.
Could at least paint the window mullions and doors with a splash of color..
Mon, Nov 19, 2012 : 10:32 p.m.
For $8.1 million can't it look a little nicer? A nice neon art deco &quot;Bus&quot; sign perhaps? Mon, Nov 19, 2012 : 10:47 p.m.